I’ve always considered myself a fairly organized person. I pretty much have to be as the mom of two girls and spouse to a man in the military. I’d be lost if I didn’t have a method for remembering everything. There’s no way I’d ever be able to keep track of all the health appointments, lessons, sports activities, birthday parties and more. My memory is good, but not that good! Today, I want to share with you an easy method I use to keep our household running. It really doesn’t take much time at all out of your day once you get it up and running. My tip is to use a family organizer! Seems pretty simple right? It is. A family organizer is something everyone in the house can benefit from. It teaches kids early on about establishing an organizational routine to be prepared for the future. Honestly, I’d be so lost without it. 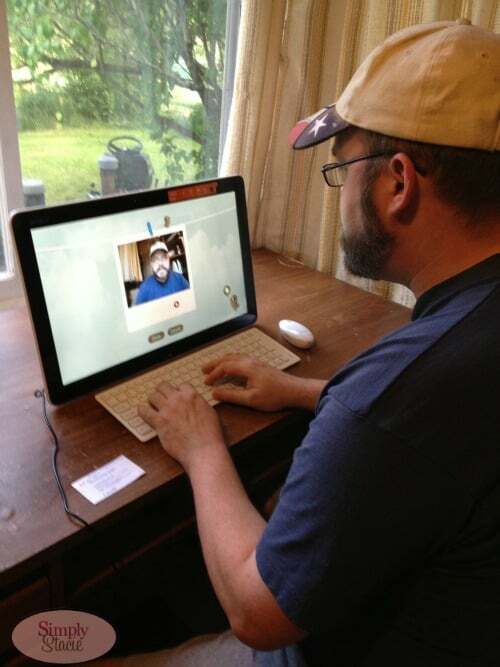 I’ve been using the Fingertapps Organizer on my Sony VAIO Tap 20 All-in-One PC. It was already installed on the PC when I got it and it’s the very first time I’ve used technology for household management. In the past, I’ve used an old-fashioned fridge calendar. I find the Fingertapps Organizer much more streamlined to use and it also does a much better job at keeping us on track. With the Fingertapps Organizer, each family member is listed in a different color along with their picture. For example, my color is red. All my events, appointments, notes, etc pertaining to me would show in red. This feature allows me to have a quick visual of what I’ve got coming up and the things I still need to do. 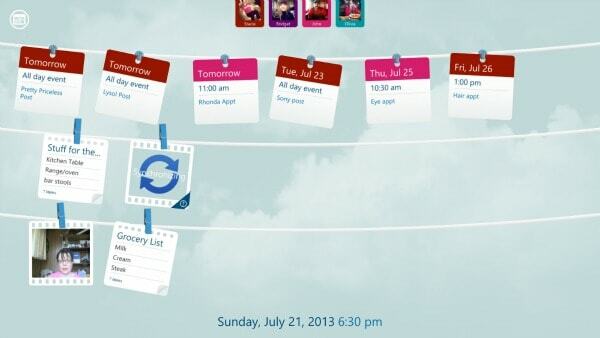 Each family member can schedule in their upcoming events and appointments. It also lets the entire family see what everyone else has going on at a quick glance. John has quite a few appointments coming up as he prepares to release from the military. I’ve got him set up and using Fingertapps to keep track of where he needs to be and when. He loves how easy it is to use! Our Sony VAIO Tap 20 All-in-One PC is set up in our back office just off the kitchen. It’s a central location so that everyone has access to it. Since it is currently summer, our schedules are more relaxed for the girls. However, once school starts again in September, I know they will benefit from the organizer. Olivia is going into grade 10 and can use the calendar to keep track of homework assignments and school project due dates. Bridget is still at an age where she is invited to birthday parties and also has plans to start gymnastics lessons in the fall. I want to teach them these important organizational skills while they are still young. 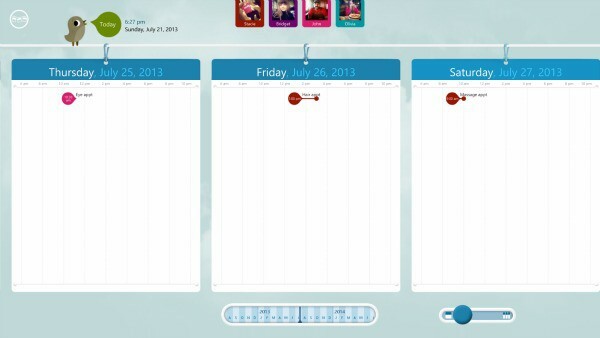 Another cool feature of Fingertapps Organizer is the ability to view just your own schedule. Simply tap the user on the screen and it will only show your upcoming events on the calendar. Everyone else’s events will still show, but they will be in grey. Along with scheduling appointments on the calendar, you can also leave video messages for other family members, create lists, notes and even draw pictures! I use it for my to-do list and once I complete a task, I simply check a box to cross it off my list. It’s much easier than having a million to-do lists on sheets of paper laying around the house! 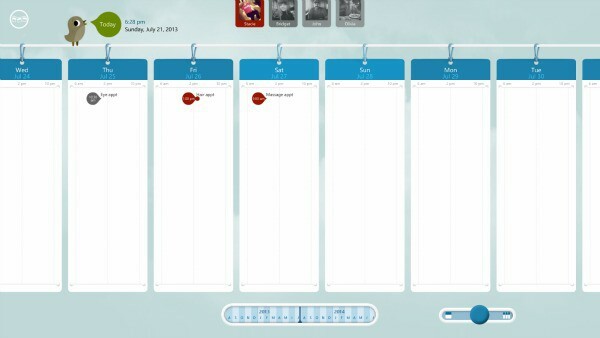 If you already use a Google Calendar or a Windows Calendar you synchronize both of them into the Fingertapps Organizer. 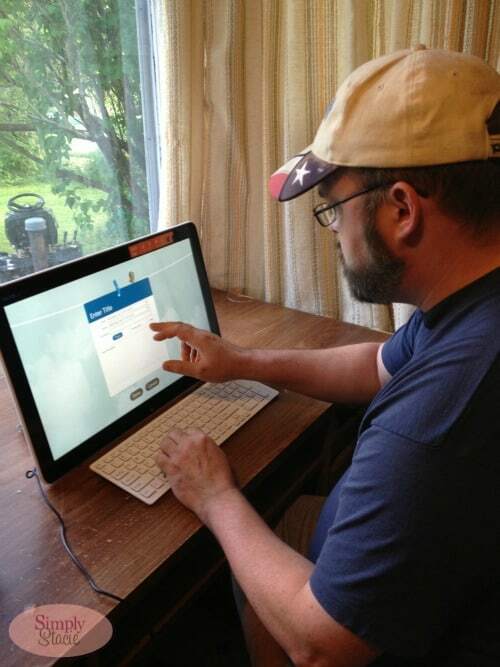 I love how my Sony VAIO Tap 20 has helped our household function better! It means less stress for me and my kids are learning important skills at the same time. It’s a win-win! The Sony VAIO Tap 20 All-in-One PC is unlike anything I’ve ever owned in the past. 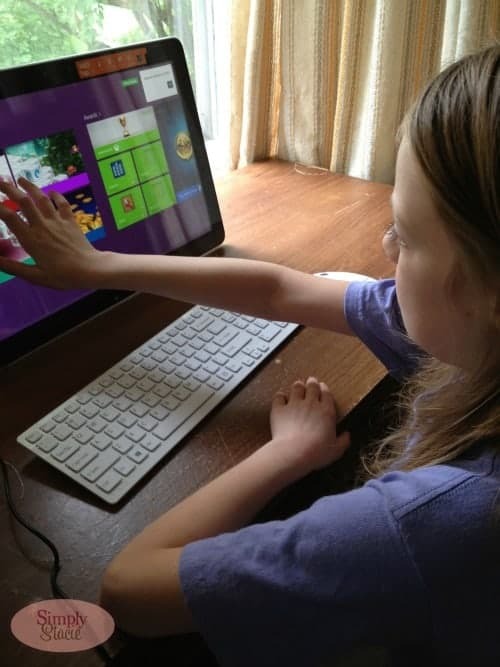 One thing that I think sets it apart from other computers we’ve owned is how it’s designed with families in mind. The Fingertapps Organizer is one example of a program that multiple people can use. If you have young children, they can both use the Family Paint program at the same time. The screen splits into two so each child has their own area to create their masterpiece. Another key feature that sets the Sony VAIO Tap 20 apart is the in-home mobility. It works as a desktop computer, but it’s also portable. You can also bring it with you around the house thanks to a built in battery. The 20″ HD touchscreen can be positioned to stand up on a desk or table at a 90º angle or lay flat on your lap at a 15º angle. We’ve watched movies on it and have brought it into the living room and had it stand on the coffee table. The screen is large and looks great from every angle. It makes for a very enjoyable experience. Plus it’s versatile. There’s so many fun things you can create with the various programs. We’ve already made a calendar and summer journal for my youngest daughter, Bridget. I’ve also been able to organize my family photos using the PhotoMemories Home software that comes with the Sony VAIO Tap 20. The Sony VAIO Tap 20 All-in-One PC is perfect for tech-savvy families. It’s something that everyone can benefit from and it’s been a welcome addition to our home. I’m enjoying all the perks it offers! Connect with Sony on Facebook, Twitter, Pinterest, YouTube, Instagram and their blog. Could your family benefit from owning a Sony VAIO Tap 20 All-in-One PC? Sony and Intel are giving one away to one lucky person! To enter tweet your favorite Sony VAIO Tap 20 feature with the hashtags #TryVAIOTap20 and #SonyVAIO. The giveaway ends on August 14, 2013 and is open to USA only. For more details, please check out the terms and conditions. How do you keep your family organized? Please share in the comments below! I participated in this Sony/Intel sponsored post with Burst Media, all thoughts and opinions are my own. This sounds like an awesome product. We can all use a little organizing right? Thanks so much for sharing. I SO need to get started on something like this for the upcoming school year, I think it would be easy to keep up with! That is very cool. What a great way to get the entire family organized. I have been trying to find something that will work for everyone & it can definitely be a challenge. What a great way to stay organized! I wish I had something like this on my laptop, although it is getting time to start looking into a new one! Very cool! I’ve never heard of such a set up. I think as my kids get older I’ll need something like this. Wow, this is a great product. I really need something like this to help me become more organized. I love the color coding feature! Was this very difficult to figure out? I really need to get more organized. No it was really easy! I had it figured out in a matter of minutes. This looks like something that would be so very useful. I keep my family organized the old fashion way. We use a calendar that hangs on the fridge. I do like a lot of the features you discussed in the review. I like that you can synchronize both the Google Calendar or a Windows Calendar. I’ve tried to use those in the past. That looks so helpful! I like the way its formatted. I really need a good calendar to start organizing my business, this looks awesome! Sounds like a great product and one that I would love to have! Oh, this looks like it would be a lifesaver for our family!! Love that it synchronizes different things to be an all in one organizer. We all need some help with organization and remembering. Whatever way we choose to do this, we need all the information in one place and easily accessible. Hope or continues to work well for you. This looks pretty awesome, Stacie! I think my husband would love this! !